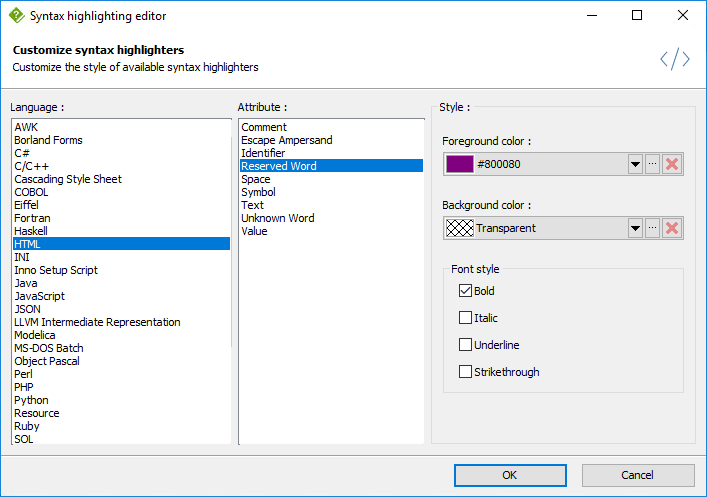 Quickly and reliably highlight sample code using one of the dozens of customizable syntax highlighters available in HelpNDoc. Adding sample code to a manual or user documentation can be a lengthy process: pasting the code is fast but readers expect the code to be highlighted in order to be more easily readable. Starting with HelpNDoc 5.6, it is possible to rapidly highlight a piece of code using one of the highlighters available. From C# to XML to HTML to SQL to CSS... simply select the code to highlight, click the desired highlighter, and let HelpNDoc do the hard work. Don't like the default font style and colors used by the syntax highlighters ? Simply use the straightforward syntax highlighting editor to customize it according to your preferences. Topics' unique help identifiers (Help ID) are used to generate the generated topics' file name. Up until now, only alpha-numeric characters were allowed in Help Ids in order to be cross-documentation compatible. We have enhanced them to also allow dash "-" characters, offering a way to create clearer, search engine optimized URLs. As always, we've solved multiple bug reports and features requests, such as the quick access toolbar's customization which is now saved and restored when the application starts. The ability to reach an anchor when CTRL + Clicking on a link in the topic editor. Enhancements in the project analyzer. Performance optimizations... And much more, as can be seen on the detailed change log bellow.